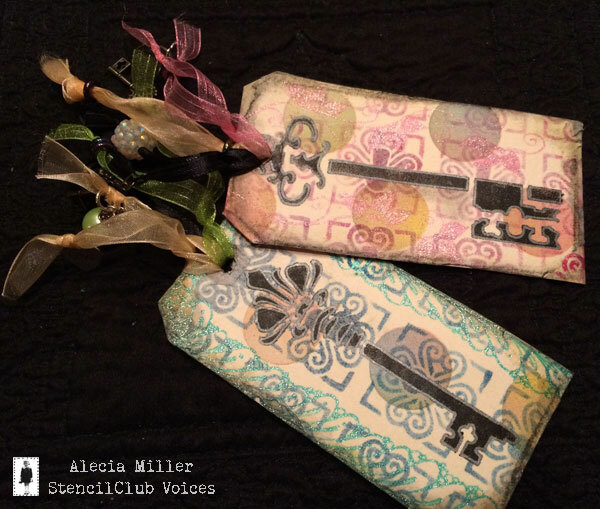 StencilGirl Talk: StencilClub Voices use keys to unlock January 2018! 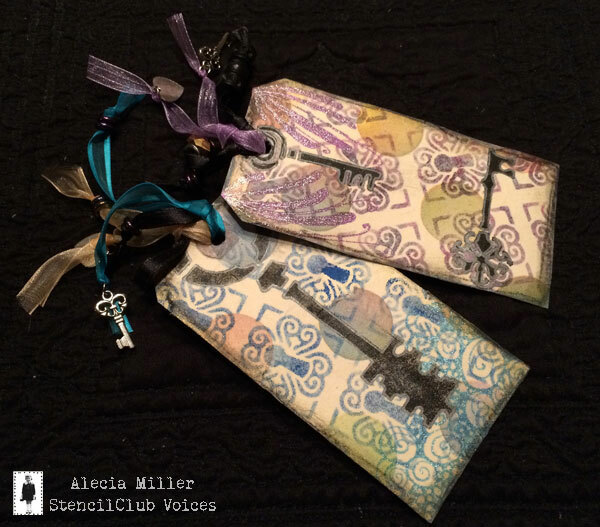 StencilClub Voices use keys to unlock January 2018! Canvases, tags, and art journal pages are in story for you compliments of the super stencil set June Pfaff Daley designed and our fantastic StencilClub Voices for January: Josefine Fourage, Dianne Hicks, and Alecia Miller. 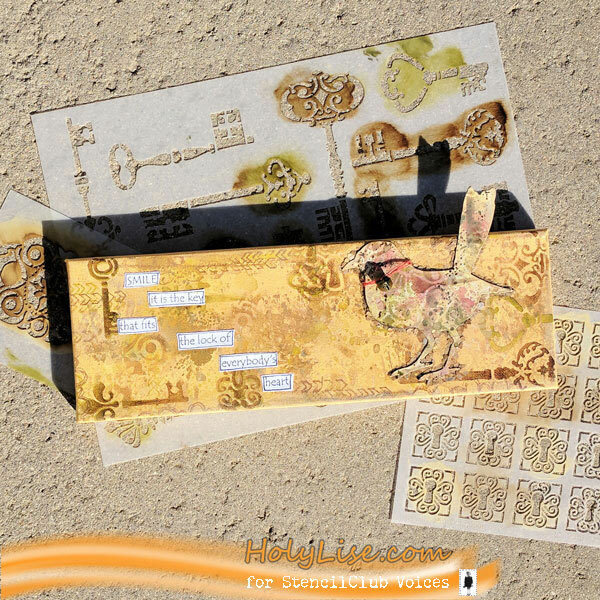 Josefine Fouarge writes: "I was super excited when I received the January StencilClub stencils. The keys from the 9x12 stencil are so unique and I love all the different patterns." "I decided to go with a long canvas. 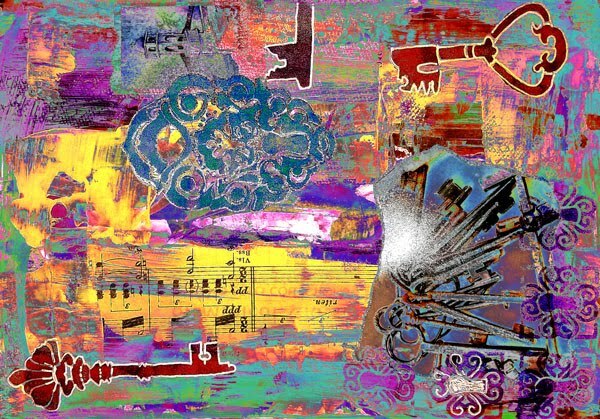 This way I could have a focal point on the side and would still be able to see all these gorgeous keys." 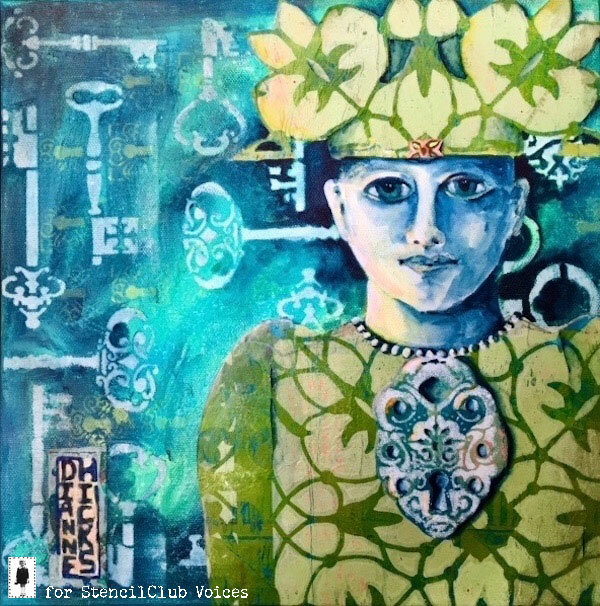 "I started with a simple background, added several paints and Distress Oxide colors and then started blending the same paints and inks through the 6x6 stencil. 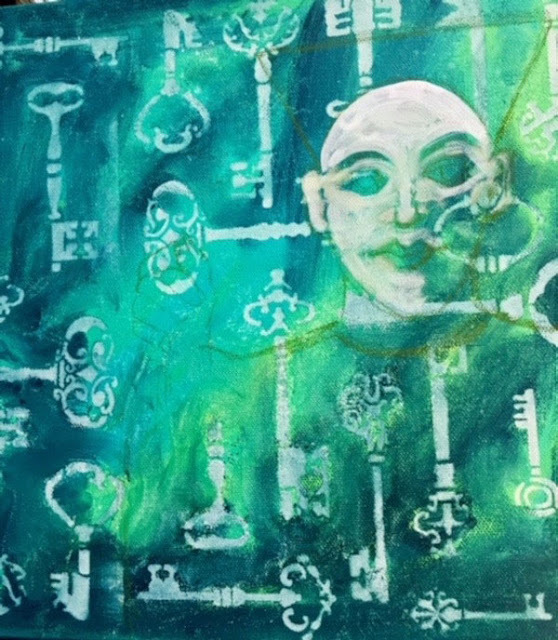 Next, I added parts of the keys all over the canvas and the lock behind my focal point. 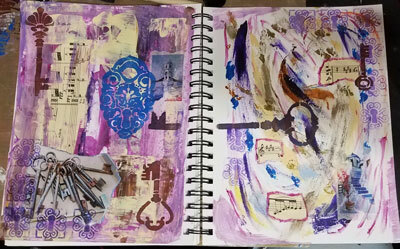 I worked in several layers between adding more keys and adding splotches of Distress Oxide ink." "While the canvas was drying, I colored the bird." "I used the same techniques and colors with the only difference that I added a little red to the bird to make it stand out. Then I adhered it onto the canvas, surrounded by gold flakes." "The sentiment is the perfect fit, I think." 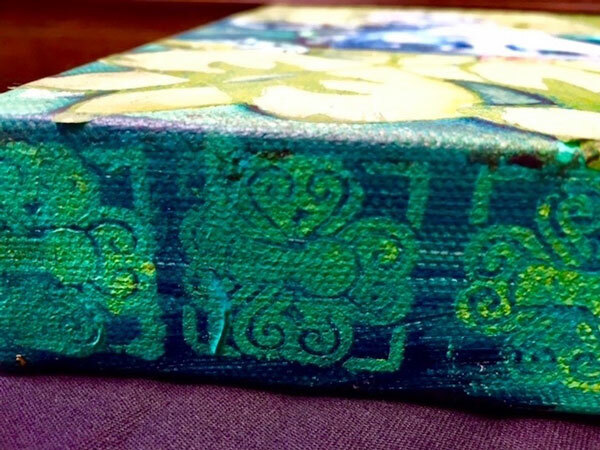 "I hope you enjoy my little canvas as inspiration for the January StencilClub!" 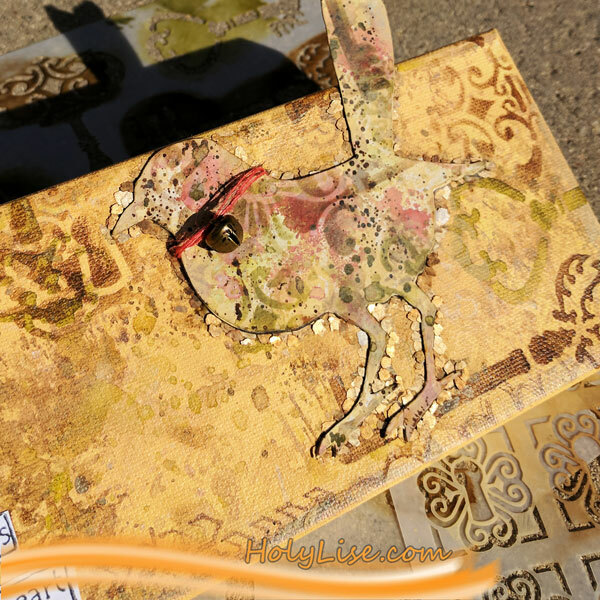 Dianne Hicks writes: "I enjoyed the opportunity to do a piece of artwork using the stencils. From the start, since I work with a lot of patterns, was so happy when I opened the package. I found that pattern was very easy to see in all 3 of the January selection." 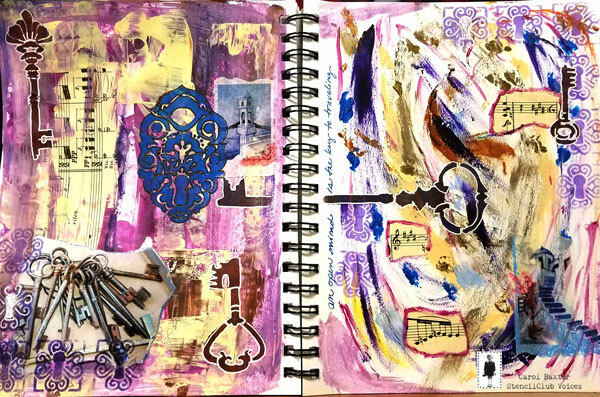 "Since the theme is under lock and key, I journaled with the thoughts of keys being connected to a future. I do a lot of what I call quirky people in my artwork so that is where my lady was born." 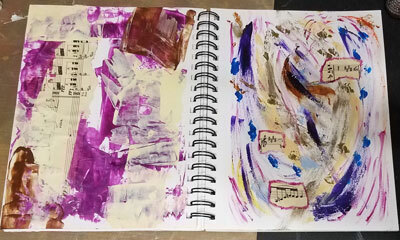 "I first painted the background and lifted the paint with a baby wipe to reveal the keys. After a little drying time, I started to lay in the face and a slight drawing of the outline in the body shape. I then went into my stash of printed papers and pulled an old stencil club printed paper to do the body and hat." 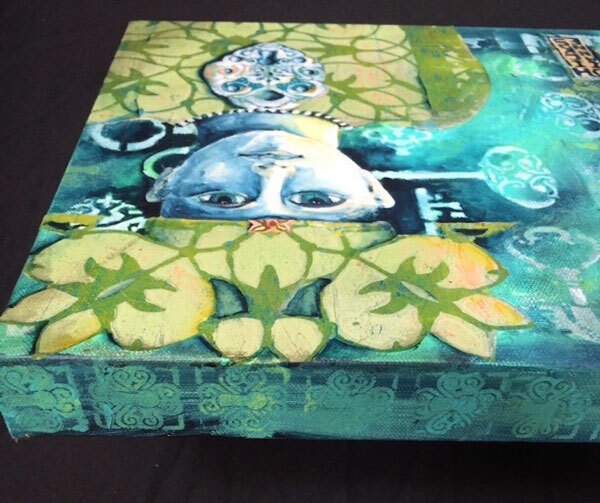 "The large 9x12 key stencil is in the background with the 6x6 on the edges of the canvas. 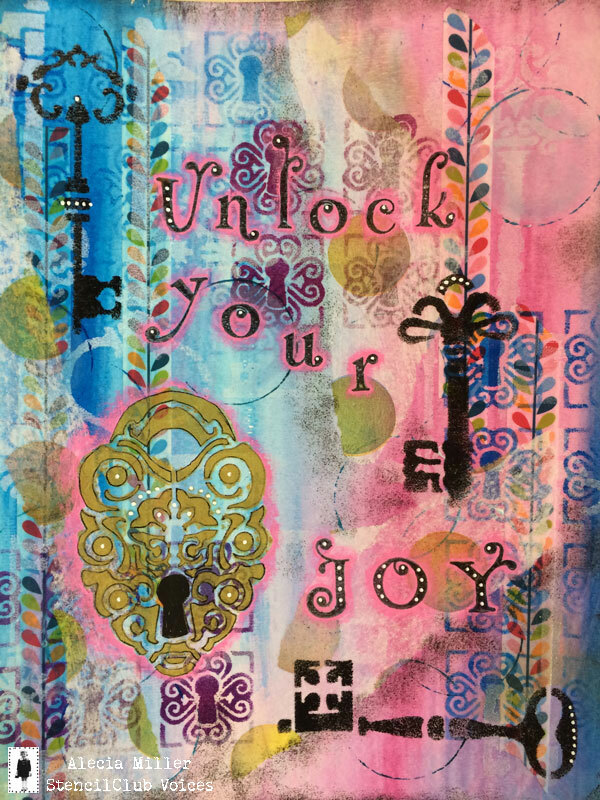 I printed the small lock stencil in several colors and imprisoned my poor girl around the neck with an additional collage piece." 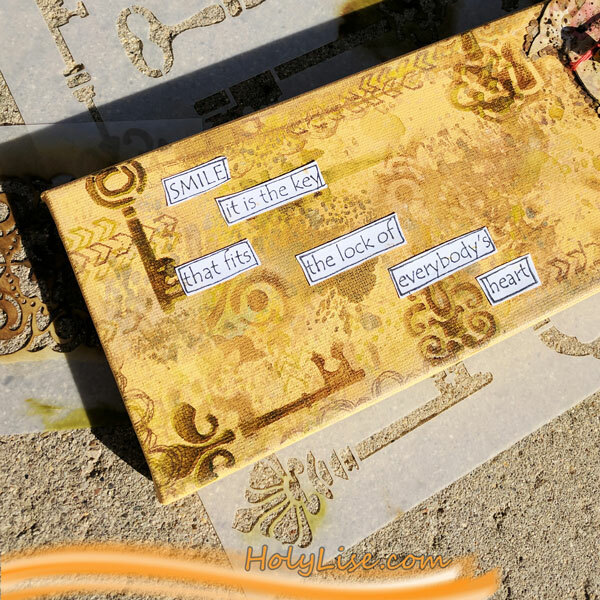 Alecia Miller writes: "I LOVE these stencils and I have always loved keys and the idea of locking secrets away safely or finding the key that unlock some great treasure. For the journal page, I chose to go with this theme, and thought the treasure we need most right now is joy and happiness and keeping a bright attitude." "They key tags were inspired by old fashioned hotel room keys with the big tassels that seem to suggest they are more important than just a simple key, so a bit of bling and sparkle was needed." After watching Mary Beth's New Year's Day livestream and looking at Alicia, Diane, and Josefine's art I jsut had to play too! I have ordered a print for myself and use it this year as a personal challenge to see if I can achieve similar striations of color in my art journal. 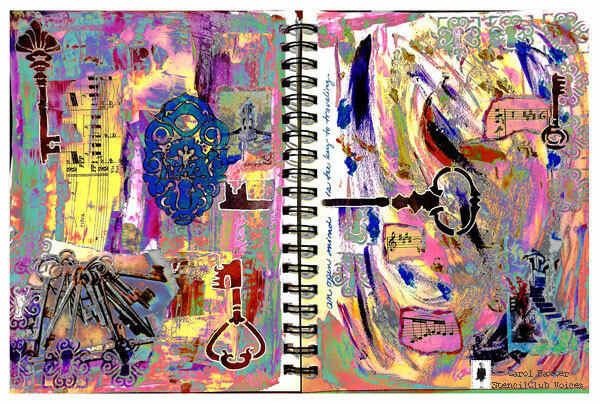 Magically, a red bird flew onto the page and is resting on the key. Do you have a favorite key? 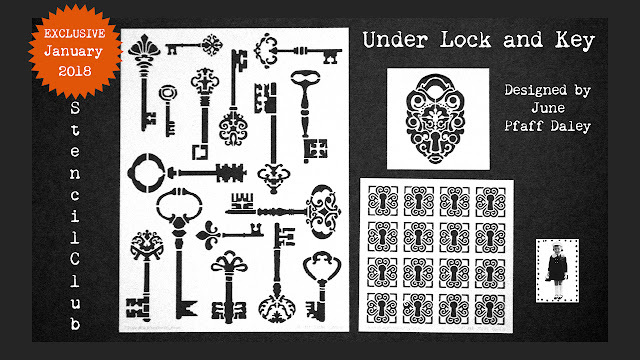 Now that you've seen June Pfaff Daley's Under Lock and Key set, what are you itching to create when you receive the stencils?